Each return of New Year's Eve brings the opportunity to symbolically say good bye to old habits and outmoded things, and begin a new chapter in one’s life with fresh ideas and a brighter outlook. Unfortunately and all too often, the celebration of brooming-out the old and welcoming-in the new is disrupted by indiscriminate gunfire into the air. The adage of "what goes up, must come down" rings especially true in this case, and with the acceleration of gravity, physics determine free-falling objects speed up as they return to earth. The danger of injuring someone with firing even a single round into the air is a lethal prospect. Each year, tragic reports nationwide tell of unsuspecting victims being struck and tragically injured by falling bullets caused by celebratory gunfire. 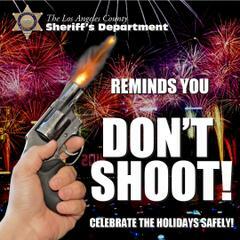 Despite public warnings and common sense, many people across Los Angeles disregard advisements and basic firearm safety, and discharge firearms into the air to celebrate the arrival of the new year. Last year, as we all rang in 2017, deputies responded to 117 “Illegal shooting” calls for service throughout Los Angeles County, neighboring contract cities and unincorporated communities. Of these calls, one male adult was struck by a descending bullet, causing a laceration to the back of his head as he stood in his front yard. The Los Angeles County Sheriff’s Department wants all to know shooting into the air is not only irresponsible, but a felony-level crime. Willfully discharging a firearm in a grossly negligent manner which could result in injury or death to a person is a violation of section 246.3(a) of the California Penal Code. If you see someone discharge a firearm in public or into the air, take immediate shelter and call 9-1-1. Do not attempt to confront the shooter. So, enjoy all the fun of New Year’s Eve offerings safely, but allow others the same opportunity to celebrate, as well: Don’t shoot.